Pepperoni, assorted pizza toppings ham, pineapple, etc. Unroll dough onto a parchment paper lined or non-stick baking pan. Bake for 7-9 minutes until golden brown. Allow to cool completely. Meanwhile, cut cheese slices using airplane cookie cutter. Cut pizza toppings into windows, stripes and other airplane decorations. Cut cooled crust using airplane cutter. You should get about 15 planes out of your crusts, depending on the size of your cutter. Spread Muir Glen™ Organic Pasta Sauce over each pizza crust. Top with a slice of airplane-shaped cheese. Bake for about 4 minutes, just until cheese melts. 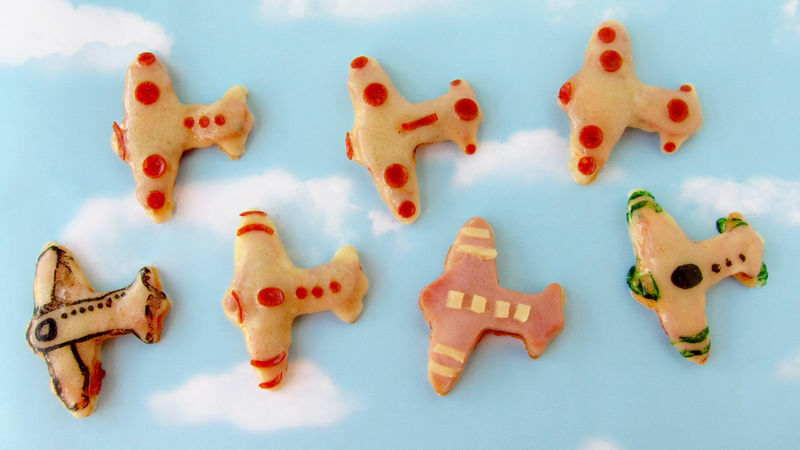 Edible airplanes touch down just in time for the new movie release, and they'll have your kids flying high! I get to spend my days playing in the kitchen, creating edible crafts, and whenever my friend's children are visiting, they want to join me. I love to see their eyes light up when they turn something ordinary into something really cool, like these Pizza Planes, which are so easy to make that even very young kids can help out. What better way to get kiddos to eat than to get 'em involved in the prep? It's like you're letting them play with their food! To make these pizzas you will need to do just a small amour of prep work before you call the kids to help. Pop open the Pillsbury Thin Crust Pizza Dough and lay it out on a baking sheet. I like to line my pan with parchment paper for easier removal, but a non-stick pan or cooking spray work well too. Bake the crust for 7-9 minutes until golden brown and then allow it to cool completely. Now grab the kids, so they can join in on the fun. Cut airplane shapes out of the pizza crust using a cookie cutter. Press down hard and wiggle the cutter around a bit to cut through the crust. Cut out about 15 airplanes. While you are working, you can heat up a small bowl of the Muir Glen Pasta Sauce and dip all those scraps of pizza crust in it. Yum. Now to the fun part. Use the cookie cutter to cut airplane shapes out of your cheese. Then cut shapes out of pepperoni, or any other pizza topping you like, and decorate your airplanes. I used mini round cutters and kitchen shears to cut circles and stripes out of pepperoni. My favorite pizza is Hawaiian, so I cut an airplane out of a slice of ham, stacked it on top of my cheese slice, then added pineapple stripes and windows. If your kids only like cheese pizza, they can use food coloring markers to decorate their pizzas. After you're done decorating, it's time to assemble the pizzas. Spread some Muir Glen Pasta Sauce over each airplane shaped pizza crust. Then pick up the decorated slices of cheese and ham -- lay them on top of the sauce-covered crusts. Heat pizzas in your oven just until the cheese melts, about 4 minutes. You'll notice that as the cheese melts, the decorations move a bit and the food coloring smears. It's O.K. You and the kids are just going to gobble these down anyway. I'd pop them into the oven to melt the cheese and serve hot.